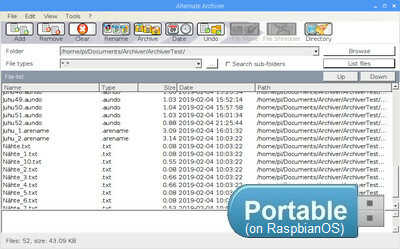 The portable version of Alternate Archiver. This version doesn't need to be installed - so it is not bound to a single computer. It can be copied to a movable device like an USB-stick and used on several computers without leaving data residues like configuration settings or registry-values. To remove this program just delete its containing folder including its links. This program and the tools Directory, Exe Packer and Splitter may also be run on Linux using the Mono-framework (and Windows Forms).